The Dow has spiked up nearly 1,000 points in six trading sessions. Similarly, the S&P 500 has shot up 6.4% in the last six trading sessions. Nothwithstanding the continued flow of increasingly bearish economic data, stock market moves like this do not occur in a bull market. The economic indicators continue to get worse – much worse. Maybe the markets are giddy because they are anticipating more money printing – I don’t know. I don’t care what so-called Wall Street scam artists, financial media imbeciles and the charts are saying. The basic underlying economic, financial and geopolitical fundamentals continue to show two developments brewing: the onset of a Greater Depression and war. The black swans are right in front of our eyes in the form of debt at every level of our system: Energy industry, student loans, auto debt, personal and credit card debt, corporate debt and real estate/commercial property/housing debt. The energy debt crack-up boom is here and now. The Government can somewhat hide the SLMA debt problem but I’ve seen estimates that as much as 40% of the $1.3 trillion is in technical default. The Government lets people go into deferment or enables as little as no monthly payments with a new income based test that Obama initiated. But the Government still has to make payments on the debt as a the pass-thru guarantor to entities that hold the student debt. The auto debt will become a problem this year: More Subprime Borrowers Are Falling Behind On Their Auto Loans. Repo rates are already at historically high levels. The enormous glut of new cars will begin to push down the resale value of repo’d vehicles, forcing big losses on banks and auto loan-backed asset-trust investors. The rate of delinquency on all of the new 3/3.5% down payment mortgages issued over the last 5 years will begin to move up quickly this year as well. In fact, the banks are still sitting on defaulted mortgages from the last housing market collapse. But the liquidity pushed on to the banks by the Fed has enabled them to endure non-performing loans on their balance sheet. And then there’s the tragically underfunded pensions…the State of Illinois has openly admitted to a $111 billion underfunding problem. Several other States have disclosed 40-50% underfunding of their State-employee pension plans. The problem with these estimates is that they rely on projected future rates of return that are too high. Most funds assume a 7.5-8.5% ROR in perpetuity. Last year most funds were flat to negative. YTD pension funds are quite negative. How is it even remotely possible that any pension fund is underfunded given that, since the 2009 low, the stock market has tripled in value and the bond yields have fallen to record lows, which means bond portfolios should have soared in value? Pension funds should be, if anything, over-funded right now. Furthermore, those underfunding estimates assume bona fide, realistic mark to market marks on illiquid investments such as CLO’s, CDO’s, Bespoke Tranche Opportunites (think “The Big Short”), private equity fund investments, real estate, etc. – you get the idea. I would bet most pension funds, public and private, are fraudulently over-marked on at least 20% of their holdings. I know many pensions have allocated in the neighborhood of 20% of their investments to private equity funds. Most of these funds are in the early stages of becoming little more than toxic waste. In other words, the pension underfunding problem is, in reality, another massive chunk of debt has been cleverly disguised and layered into our system. It has been yet another mechanism by which the Wall Street racketeers have sucked wealth from the middle class. By all appearances, this recent dead-cat bounce in the stock market is quickly losing steam. Macy’s stock is up 1% because it “beat” estimates using “adjusted” EPS. “Adjusted” is a euphemism for “recurring non-recurring expenses that we strip out of our reported net income calculation to make the headline earnings report look better.” Of course, hidden in between the lines is the fact that Macy’s revenues and net income (any way you want to calculate it) has dropped precipitously year over year. It’s impossible to know for sure how much longer this parabolic spike up can last. 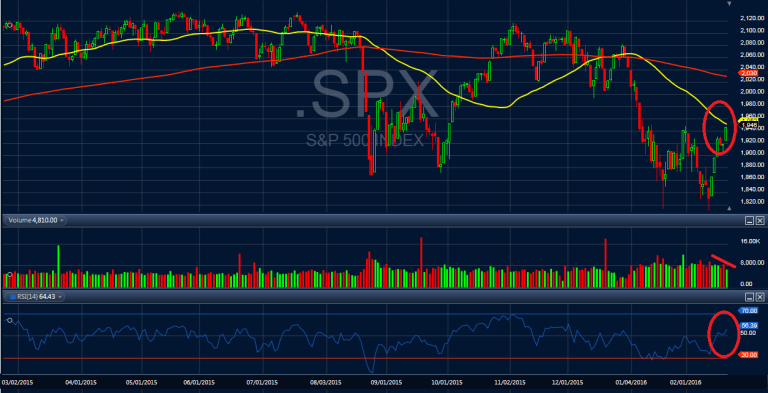 It might even run up to the 200 dma (red line). But inevitably the market take another parachute-less base jump off a tall building and remove another chunk of money from daytraders, retail investors and their moronic advisors and, of course, pension funds.